Where 2.0 is a world-renowned meeting of the minds focusing on location-based technology lead by O’Reilly Media. FireWhat Inc. has been invited to join the discussion. The staff will be presenting to the industry on their ideas to modernize the fire service. Current fire perimeters, such as the Lower North Fork Fire currently burning in Colorado, is now available as a smartphone app. O’Reilly Media is hosting its sixth annual Where Conference April 2-4 in San Francisco, CA. The conference focuses on the growing business of leveraging the location awareness due primarily to GPS technology built into today’s ever-increasing mobile user market. Former invites include managers from Intel, Google, eBay, Loopt, Groupon, and others. The conference is a chance for today’s industry leaders to come together and brainstorm the future. FireWhat Inc. CEO Sam Lanier is an invited guest speaker, and will be presenting to leaders in the industry his ideas to modernize the fire service. FireWhat is a start-up company based in Dunsmuir, CA. Their mission is to bring life saving innovation to a technology deprived industry. Formed by professional firefighters, the idea came from years of hands-on observation of the lack of technology used in the fire service, and the incredible tool it could represent to those protecting lives and property. The company has built a series of partnerships including NASA, Carnegie Mellon University, and Weather Underground Inc. to develop a platform to map and track wildfires across the nation. 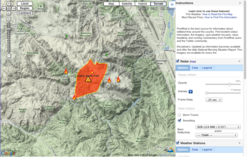 Active fire perimeters are plotted on a Google Map projection to include local live weather, terrain, roads, and water features. Each fire event also lists pertinent fire data such as size, spread, number of committed resources, and expected containment date. FireWhat created an iPhone App, the Wildfire Pro, and released Version 1.0 in October of last year. The firm has continued their app development offerings with two new apps, the Wildfire Home and Wildfire Info, along with an Android-compatible version of the Wildfire Pro. Wildfire Home is designed for homeowners, with guides to prepare the house prior to a wildfire, and what to do in case of evacuation. The Wildfire Info App is free and presents the mobile mapping technology. The new apps are scheduled for release to the public in the iTunes App Store on the day of FireWhat’s presentation at Where 2.0 in San Francisco on Tuesday, April 3. FireWhat Inc. is a start-up company founded by an MIT grad and two professional firefighters. FireWhat's mission is to bring life saving innovation to a technology deprived industry. Pusher Inc. is a creative design agency specializing in web, video and mobile app production. Staffed by designers, engineers and educators from the likes of Apple, Sony, Stanford and Harvard, the Pusher team performs best-in-class research, design, development and production services for niche experts who are ready to launch to the next step in their business or social enterprise.